Quaker parrot variation is usually a difference in color only. The diminutive but highly assertive quaker parrot is a favorite feathered friend for many pet owners, including those just starting out in the bird world. You may be baffled to hear experienced parrot owners utter strange words like "pied cinnamon blue monk." They're just discussing quaker parrot varieties. 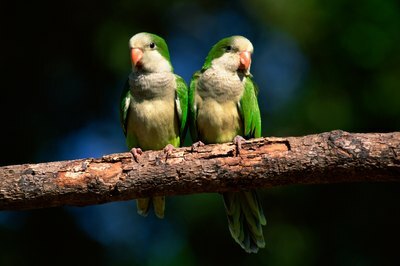 The quaker parrot is also known as the monk parakeet. Despite the names, these birdies are neither black-and-white, nor particularly peaceful or holy. They're brightly colored, raucous, intelligent and talkative -- even aggressive, when their feathers are all in a ruffle over something. "Quaker" refers to the rocking motion these birds do when they're peeved or trying to show you who's boss. "Monk" is said to derive from their green head-feathers, which someone thought looked like a monk's hood (must be a funky monk). "Parakeet" is a technical term that refers to the length of the tail feathers. Quakers are true parrots, and are not budgerigars, the birds usually called "parakeets" in the U.S.
Quaker parrots have the species name, Myiopsitta monachus. There are four races of this South American native: the M.m. monachus, M.m. calita, M.m. cotorra and M.m. luchsi. Almost all pet quakers are M.m. monachus -- and yours should be, too, because you must get your quaker parrot from a rescue or a breeder, and not caught from the wild. These birds are endangered in their native home, and are covered by the CITES laws, meaning it's an international crime to catch a quaker parrot from its wild home and sneak it into another country. Natural quaker color is dark green along the back, with lighter feathers on the front, and bluish flight feathers and tails. These colors are accessorized with a bright-orange beak and grayish feet. The different varieties that dazzle your eyes on pet-bird websites and in pet stores are color mutations. Different people use different terms for these mutations. A color pattern might be called "lutino," for example, by one breeder, and just plain "yellow" by another. Breeders have established a few quaker color "lines." The most common is blue, which is just like the regular monk parakeet, only mostly blue instead of green -- except for the "blues" that are really gray. Cinnamon is another common variety. It would be reasonable for you to expect these to be brown or red, but they're not. They're yellow with some green and blue, and white on the bottom. Pearls are grayish or bluish; pieds are green and yellow mixed together all over the body, and albinos usually are white with reddish eyes and yellowish feet. Besides the riot of colorful old-timer lines, there's a veritable army of newer "designer" birds in the quaker parrot community. The result of crossing different true-breeding lines or of occasional random mutations, these birds come in all sorts of colors and patterns, with names like cinnablue, green pallid, white-winged blue and dark-eyed white. Lines of these colors are not established, or are very new. Seemingly paradoxically, Quakers are simultaneously endangered in their native habitat and considered introduced pests in some U.S. states where flocks have become naturalized. Both of these statuses are the unnatural consequence of the pet trade -- unscrupulous people who deal in quaker parrots captured from their native environment, a few escapes, plus irresponsible owners who have dumped unwanted birds. Some states have eradication or pest-management programs for these guys, while they are protected by endangered species laws in their countries of origin and internationally. It's a good idea to check out the laws covering owning quakers in your state -- in some places, they're not legal. Please be sure you're getting your new little guy from a reputable breeder or rescue. Quaker Parrots: Blue Quaker Parrot vs. Green: What's the Difference? Quaker Parakeet Society: Just What is a Quaker? Can Dogs Eat Corn on the Cob?